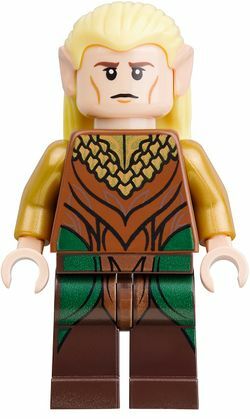 Legolas Greenleaf is a minifigure based on a key character in The Lord of the Rings movies, an Elf who helped free Middle-earth from the dark lord Sauron. 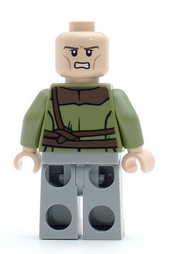 The minifigure was introduced in 2012 in The Lord of the Rings theme and was later released in a different variant for The Hobbit, also in 2012. The first variant of Legolas, appearing in 9473 The Mines of Moria, depicts him in traveling apparel. His head, like his hands, is light nougat. His face has brown eyebrows, black eyes, high cheekbones and a calm, slightly impassive expression. His hairpiece is blond. Included in the mould are the Elf's two pointed ears, coloured light nougat as well. 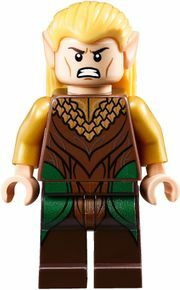 The alternate expression on the back of Legolas's head depicts him with clenched teeth and creases in between the eyebrows in a grimace. 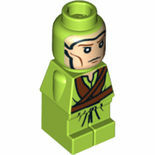 Legolas's torso sports green arms and a light green cloak, the printing of which is continued on the hips and upper legs. It has two thick, light brown lapels running down the cloak at an angle, making a V. Curls of thin sand blue lines decorate the lapels. A thin brown belt runs diagonally from the left shoulder to the right hip. It has an elaborate grey buckle near the top. Another belt, this one horizontal, is located at his waist. This belt is light brown with slightly darker coloured embroidery. It is tied in a knot near his left side, next to where the buckle is. At the top and in the center of the chest, underneath the cloak, a section of a sand blue shirt with grey clasps is visible. The back printing of the torso has the brown lapels that have joined together at the top. Two brown belts, one over the other, are at the waist. the uppermost belt has, on the left side, a knot tied. From this knot is a slightly diagonal strap that leads to the shoulder. Legolas's hips, as mentioned before, continue the cloak printing of the torso and carry it down to the legs which, aside from the folds and ripples of the green cloak, are sand blue. This variant appears in 79001 Escape from Mirkwood Spiders. The only piece the two versions have in common is the part that makes up Legolas's hair and ears. His face is double sided. On one side, he has a neutral, almost somber expression, with the eyes slightly larger than normal and the mouth turned down slightly. His alternate expression sports bared teeth and slanted eyebrows in a snarl. Two creases, one larger than the other, are located in between the brown eyebrows. One of his main recognizable features, the high cheekbones, are also present. His torso has printing of Elven armour. Golden chain-mail is located in the center of the chest, starting at the top of the torso and ending in a point in the middle. The gold colour is also present on the unprinted arms. Elaborate plates of overlapping, reddish brown armour run down his front, with earth green outlines of leaves symmetrically placed on each side. The back printing continues the chain mail in the upper back. The rest of the back is reddish brown with black outline printing. Three gold dots in a vertical pattern are on the left side, while three brown markings mirror them on the right. Thin green, interweaving lines run down the center of the back. Legolas's hips and legs sport a splash of earth green on each side, symmetrically. Apart from this and a lighter brown design carried on from the torso in the groin area, the legs are dark brown. 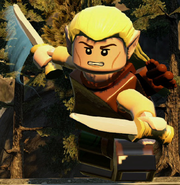 In LEGO The Lord of the Rings: The Video Game, Legolas' appearance is based on that of his physical The Lord of the Rings minifigure. In the game, his default weapon is at first an "Elven Bow", but after visiting Lothlorien, he is given a new longbow, "Galadhrim", which replaces his old one. Both of these bows have the same function- they can be used to shoot enemies and other objects, including targets which are only able to be hit by arrows. In close-quarters combat, Legolas automatically switches to twin daggers, which are based upon the daggers that Tauriel comes with in 79001 Escape from Mirkwood Spiders. However, these daggers can be selected to be out by default instead of the bow. Like all other Elves, Legolas can jump higher than non-Elven characters, walk and jump on tightropes and chains, and swing around on embedded arrows or poles up to places otherwise unreachable. Legolas is also classed as a "tall" character, meaning that he is able to walk through snow and also has the ability to pick up "short" characters. Legolas was an Elf prince from Mirkwood, the son of King Thranduil. When the One Ring, the weapon of Sauron, was reported to have been found, Legolas was sent to Rivendell as one of the representatives of the Elves at the Council of Elrond. He, along with eight other members of the Council, joined what would be known as The Fellowship of the Ring to protect and aid Frodo Baggins on his quest to take the ring to the one place it could be destroyed: the volcano Mount Doom, the birthplace of the ring located in the heart of Sauron's realms. While in the Fellowship, Legolas met and became good friends with the Wizard Gandalf and the ranger Aragorn, who was the heir to the throne of Gondor. Legolas and the Dwarf Gimli, having gotten off to a rocky start at the Council of Elrond, nevertheless came to respect each other, if not grudgingly. The Fellowship set out for Mordor, where Mount Doom was located. They were hindered, however, by the magic of Saruman, a wizard who had joined forces with Sauron. After being delayed and cut off several times by the corrupt Wizard's magic, the decision to travel through the Dwarf city of Moria was made. Upon arrival, however, they found that the Dwarves had long since been overrun by Orcs. The Fellowship was attacked by several Orcs and a Cave Troll in the room of Balin's tomb. In the ensuing fight, Legolas displayed his remarkable skills with a bow and arrow, accurately dispatching of many Orcs and eventually killing the Cave Troll. Legolas and his companions were able to escape Moria, but not before Gandalf sacrificed himself to save the others from a Balrog. While continuing their journey, the Fellowship was attacked by a large group of Uruk-hai, elite Orcs whose job it was to take any of the four Hobbits in the group, as one of them, Frodo, carried the One Ring. Legolas and the others fought hard, but were unable to prevent the death of Boromir, nor the Uruk-Hai's capture of the Hobbits Merry and Pippin. As Frodo and another member of the Fellowship, Sam, had continued their journey alone, Legolas, Gimli and Aragorn decided to track down the band of Uruk-Hai and rescue Merry and Pippin. The three members of the Fellowship tracked the Uruk-Hai for days. Legolas, with the heightened senses of an Elf, was able to see farther than his companions and proved to be even more important than before. The trio soon met up with the Riders of Rohan, a city of man that was struggling against the forces of Saruman. Legolas and the others were informed by the riders' leader, Éomer, that they had already slain the Uruk-Hai some time ago. Legolas and the others soon found the remains of the elite Orcs' camp and began to lose hope, believing Merry and Pippin to be dead. But tracks leading away from the battlefield were soon discovered, along with the torn ropes that had once bound the Hobbits' arms. The trio followed the tracks into Fangorn Forest, where they were met by Gandalf the White, reborn after his duel with the Balrog. Under Gandalf's orders, Legolas and the others traveled to the capital of Rohan in order to free its king, Théoden, from Saruman's spell. Having been liberated from Saruman's hold over him, Théoden ordered that the people of Rohan move to the fortress of Helm's Deep in order to prepare for the coming battle. The journey to Helm's Deep was long and strenuous and was made more difficult by attacking Wargs. Upon arrival, Legolas and the fighters of Rohan were joined by the Elves, who sought to reestablish their alliance with the humans. By nightfall, the Uruk-Hai had arrived. Legolas again displayed his skills with a bow and arrow, knocking out ropes that held up ladders and sending groups of Orcs falling to the ground below. In a competition with Gimli to see who could get the most kills, Legolas counted forty-two, one Uruk short of Gimli. After the battle of Helm's Deep, Gandalf, Aragorn, Gimli and Legolas traveled to Isengard, the home of Saruman. They found Merry and Pippin alive and well and discovered that the Ents, led by Treebeard, had taken over Isengard and destroyed the orc forges. In Isengard, they discovered Sauron's next plan: to attack Gondor, one of the last free kingdoms of men and the one of Aragorn's birthright. In the battle that followed, one that continued through the night and well into the day, Legolas defeated many orcs and even killed an Oliphaunt, a giant elephant-like creature with spike-lined tusks. With the help of a ghost army and the riders of Rohan, the battle was eventually won. The now combined forces of Rohan and Gondor traveled to the gates of Mordor, where they dueled countless thousands of orcs in order to distract Sauron and give Frodo a chance to destroy the Ring once and for all. With the help of the Eagles, Legolas and the men of the West held out long enough. The Ring was destroyed and with it, Sauron and his armies. Legolas was also present for the inauguration of Aragorn as the new king of Gondor. Legolas was extremely skilled with a bow and arrow missing only one target during his journey, due to Gimli deliberately jolting his bow. Legolas also carried two Elven knives. In combat, he showed creativity and adaptation, once sliding down a staircase standing on a shield, all the while firing his bow. Legolas has the same hairpiece as Haldir. In a promotional image Legolas has a knife and in the video game he has two, while in the sets he appears in he has none. Legolas is portrayed by Orlando Bloom, the actor who also played Will Turner in the Pirates of the Caribbean film series. A Prince of the Elven Kingdom of Mirkwood, Legolas Greenleaf masters a bow like no other in Middle-earth. He moves like lightning - swift, and graceful. His senses are sharp, and he is always at one with nature and all living things. He is an Elf of few words and remarkable actions and likes a little healthy competition among friends in battle! Sliding down stairs at Helm's Deep on an Uruk shield. Legolas A Prince of the Elven Kingdom of Mirkwood, Legolas Greenleaf masters a bow like no other in Middle-earth. He moves like lightning - swift, and graceful. His senses are sharp, and he is always at one with nature and all living things. He is an Elf of few words and remarkable actions and likes a little healthy competition among friends in battle! This page was last edited on 12 January 2016, at 23:18.